(Spanish American War Patriotic) Mil. P. Sta. No. 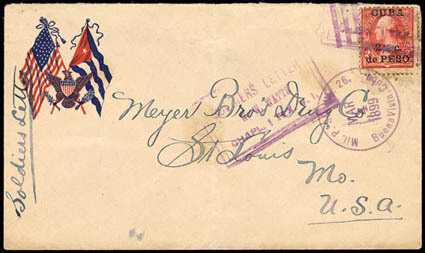 26, Buena Vista, Cuba, Mar 4 1899, purple duplex ties Cuba 2½c on 2¢ reddish carmine (223) on patriotic U.S. and Cuba Flags cover to St. Louis, Mo., endorsed "Soldiers Letter", purple "Soldiers Letter, W.W. Watts, Chapl. 1 Tex. V.I." framed handstamp and second partial strike also ties 2c, St. Louis via Nashv. & Stl. R.P.O. Mar. 11th receiving backstamp; central crease, F.-V.F. A link back to Sale 75 - Lot 177, along with its description, will be appended to your message.